It is Christmas day, 2012 and it has been 5 years since our family tradition of you shepherding your brother and sisters down the stairs so that your dad could get that first reaction picture of Christmas morning. Of course the holidays bring out the longing for you in a most poignant way. Time has eased some of the pain and I’m able to listen to your favorite Christmas songs this year for the first time, even though it isn’t without tears. Donny Hathaway’s, “This Christmas” and Coltrane’s, “Favorite Things,” transplant me back to the days of you crooning your way through the house decked out in your Santa hat, sipping eggnog. I’m able to smile through some of these tears and I pray that you hear me when I talk to you. We are changed, as of course we should be, and there has been growth and grace that has infused all of us. We speak your name everyday. You always live in our hearts and your name and a Jordan story is never far from our lips. We are making our way through the holidays and learning to keep you with us as well as find new ways to learn to celebrate and feel joy, with the knowledge that we’ll be united again. We’ve changed some traditions because the weight of attempting them without you here to participate was too great. The Christmas tree is now adorned with lights and a few ornaments, although while I don’t push anyone else, I’ve taken over a good deal of the tree decorating. 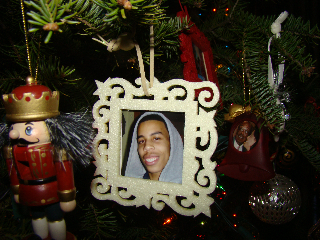 I even have a special “Jordan” section where I hang pictures of you, ornaments that Julie made, as well as all of the ornaments you always insisted on putting on the tree. Don’t worry the nutcracker is in your section. Your brother and sisters have the most trouble with the tree which just exemplifies how much you were/are their beacon for certain things. We no longer go as a family to pick out the tree. Merrick, Lindsay and Kendall politely respond, “No thank you,” when we ask them if they’d like to go with us to tree shop. Your dad and I have found a new lot to go to where we spend less than ten minutes, always finding the perfect tree in record time. I always feel like you’re steering us to just the right place. Gone too are the days of all of us decorating the tree together with Christmas music playing in the background. Merrick asked on the first Christmas we spent without you if we could just leave the ornaments out and when you felt like it, you could place one on the tree. That has turned into our new tradition. Your siblings make their way to the tree in solitude, I’m sure thinking of you. I’ll go into the living room periodically and see that they’ve hung their photo ornaments and maybe a jingle bell or two. In the midst of the season I’ve had my moments of doubt as to whether I could make it through without falling apart. I said to a few friends that I wish I could just sleep until January 3rd and not have to feel the anxiety and angst of missing you that always creeps into my spirit no matter how hard I try to breathe through the pain. All of these thoughts occurred in the frenzy of the Christmas rush when I was shopping, thinking of the tree and wondering how I would muster cheer when the greatest gift I wanted was you ambling down the stairs with the rest of the kids. I took a moment to imagine such a plan and realized it would leave me missing out on so much of the life force that are our family, friends and even me. Plus, I’d never want to miss a glimpse of you and your spirit. I’m getting better, feeling the heaviness of sorrow less and accepting healing more. Healing comes in so many forms and this year it was allowing myself to weep openly in front of your dad instead of retreating to the bathroom before we came downstairs this Christmas morning, saying aloud what I think so many times, “How did we lose a son?” The tears are cleansing and every year finds me stronger and more resolute in the fact that I indeed am the mother of four with three surviving children. One present I gave myself this year was the decision that I don’t have to think of you as forever 19. You would be 23 years old now and when I sit and close my eyes, I see your beautiful brown eyes, the way your jaw would have become more angled with age, the bass that has settled into your voice and of course your smile. You will grow older with me. It is a perfect solution to a problem that felt unsolvable. Thank you for my Christmas gift. I sat down many times in the last month trying to write a holiday letter to send out to friends and family. This year like last, I wasn’t up to sending out Christmas cards and felt so guilty about it. Every time I tried to write, the words wouldn’t come. I finally realized why. The person I most want to write to is you. I miss you. It is Christmas again and I’d give anything to hear you singing your way through the holidays. I’m finally able to listen to “This Christmas.” For the past 2 years if I heard it on the radio or my Ipod I immediately switched it off. It hurt too much to think of that song as timeless and you’re not here to share Christmas with us. Merrick is home from his first semester of college. I know you are so proud of him. He loves his school and is making genuine friends who care about him. You know Merrick. He was so worried that he wouldn’t fit in. I know you are part of the reason that he stayed true to himself and let friendships evolve naturally. You always told him to, “Keep it real,” and that’s what he is doing. His spoken word poetry is a big love and you are a mainstay in his poems. He misses you so much and talks about you all the time. The other day he reminded me of how you used to act out the “Little Drummer Boy,” song. You loved Christmas so much! Your sisters are flourishing. As they get older their memories of you seem to get stronger, not fade away as I had feared. I know you reside in their hearts and I thank you for holding them close. They both just tried out for the volleyball team and are waiting to hear the results. They’ve also followed in your acting footsteps and have been in a couple of plays. Your dad is as busy as ever with work. He’s traveling a lot but he’s so good at finding a balance between work and home. You know your dad, family man all the way. You’ll be happy to know that all your encouraging and cajoling paid off. Your dad works out regularly and always says he wants to make you proud of him. As for me, well like the rest of us I have good days and bad days. But the good days are starting to stretch out in frequency as I make peace in my heart that you are safe. I continue to write and hope one day soon to have my book finished. Your words, “Mom, when are you going to write your book?” echo in my head and fuel me to forge ahead writing about my precious son who left too soon. The Christmas tree is up and all the stockings are on the mantel. Like every year past, yours is hung between Merrick’s and mine. I’ll write my little note to you on Christmas Eve as I have since you died and place it in your stocking. I imagine that one day, when my time to join you is drawing near I’ll sit and read all the notes knowing they’re filled with the love, pride and longing I have for you. Thank you for being my son and for continuing to help me know what is good and honorable in this world. You are such a bright light. My newly minted freshman in college is a part of the October snowstorm that hit the northeast this past weekend. The town where Merrick’s school is located lost power on Saturday and is still in the dark. Merrick called home Saturday night to update us and we advised him to conserve his phone’s battery even as we peppered him with questions. Then the tears came and I sat cradling the phone making sure he knew I was there but allowing him to vet every emotion coursing through him as he sobbed for all he’s lost and all the longing he has for his brother. The week wore on and I’d talk to him every other day, “Just checking in,” were my words when I couldn’t keep myself from calling. I didn’t want him to feel like I was worrying too much about him but I was, and the only thing that made me able to cope was hearing his voice. On Sunday morning after the storm, Mark and I were both awake by 7:30 and Mark immediately reached for his Ipad to check the outages on the East Coast. Merrick’s town still had no power. I was grateful he was still asleep and hoped that maybe by the time he woke up the power would be back. Later that morning we got a call from Merrick from the cellphone of one of his friend’s saying that the campus had run out of food and they were strongly encouraging students to evacuate the campus. The administration suggested they go to a neighboring school that did not lose power or home if they lived close enough. Merrick then went on a rant about AT&T and how he had no “bars” and the only people that did were those with Verizon and T-Mobile. He ranted about his phone but we heard the panic in his voice and his need for us to help him figure out what to do. He was weary from October. We had to decide what was the best option so that he could feel safe. Realizing that soon we wouldn’t have any connection with him if his friends all scattered because some were going to Boston to stay with friends and some were going to neighboring schools, we had to help our kid figure out the best place for him. Thankfully he knew us well enough that he didn’t impulsively just go someplace without letting us know. Jordan’s trip during his Fall break from college took a detour from New York to Baltimore which he texted us about as he rode to Baltimore. I never got a chance to tell him, “That wasn’t the plan,” or “No, stay in NY.” I wonder if I could have kept him safe, kept him alive. On the drive back, just 20 minutes from campus is where the car accident occurred and he was pronounced dead at the scene. He was riding with 3 friends when the driver fell asleep and the car careened off the interstate falling 40 feet onto the service road below. As much as we want Merrick to have freedom as a college student and be responsible for making decisions, Jordan’s death has cast a veil of vigilance over the rest of our children. Merrick choosing the same small town as his brother to go to school has heightened our anxiety. He says he understands but how long can my fear of young people and road trips determine my son’s actions? He is 19 and I want him to be 20,21 and on and on. There will come a day when he does take a trip with friends and I’ll have to grit my way through it. My feeling now is that I won’t breathe until he’s safely at his destination and then safely back. It’s not how I want to live. I hope I’ll regain some calm and faith, but I’ve become a maven of safety statistics of buses, planes and trains vs. cars. Cars lose every time. For anyone observing Mark and I as we tried to figure out the best and yes, safest place for Merrick to be until he could return to campus, you would have thought we were planning a reconnaissance mission. Mark paced the family room as I sat with my laptop googling hotels, looking up friends on Facebook trying to remember who lived in Boston. Tears were all I could muster as a reply as the words, “Merrick is not Jordan,” were the mantra on my mind.